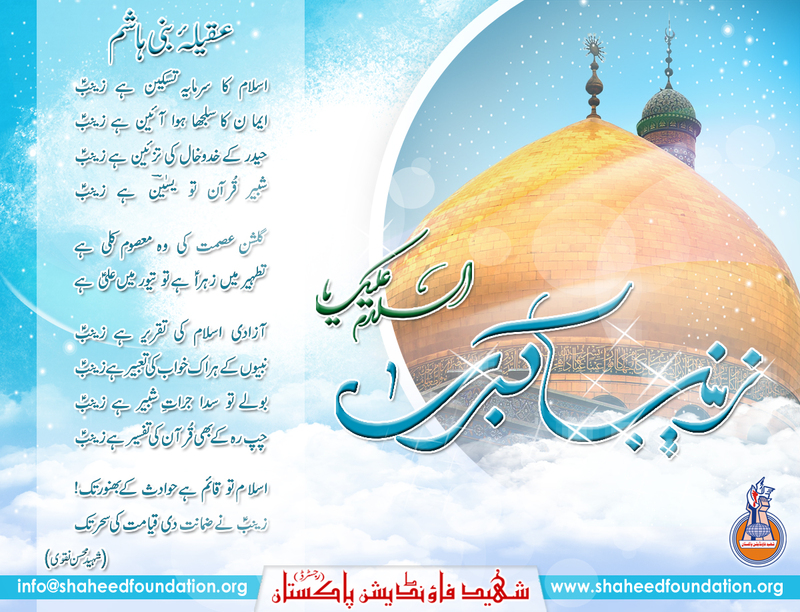 Shaheed Foundation Pakistan extends our heartiest greetings and felicitations to the Household of Rasool-e-Khuda[SAWW] especially Imam-e-Zamana[atfs], Rahber-e-Moazzam Ayatollah Sayyid Ali Khamenei, Shohada-e-Azeez,Maraj'een-e-Ezam, Ulema-e-Karam, Khanwada-e-Shohada and all momineen o mominaat on the blessed occasion of the birth anniversary of Aqeela-e-Banu Hashim Sayyida Zainab Bint-e-Ali [SA]. She had barely attained the tender age of seven when her beloved mother passed away. Her mother's death had closely followed her cherished grandfatherÃƒÆ’Ã‚Â¢ÃƒÂ¢Ã¢â‚¬Å¡Ã‚Â¬ÃƒÂ¢Ã¢â‚¬Å¾Ã‚Â¢s passing away. Sometime later Imam Ali (AS) married Umm ul-Banin, whose devotion and piety encouraged Zaynab (AS) in her learning.